Drilled for 11 inch Diaphragm, Borg & Beck, Long, and Mark 12 pressure plates. Hays steel flywheels are manufactured from certified billet material that will not break up under the stress of high RPM and severe punishment of racing. 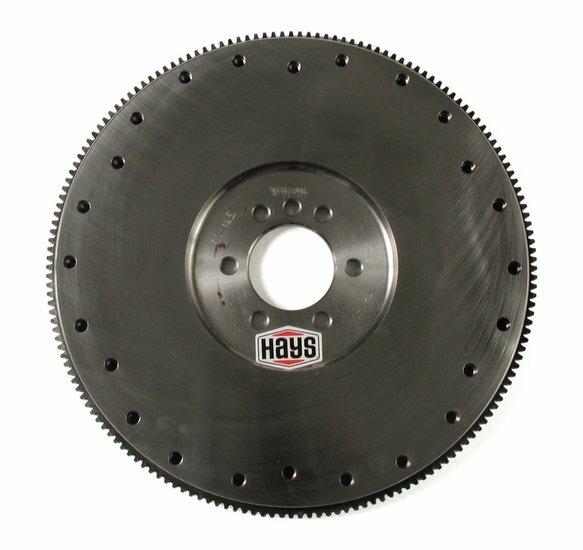 The 25 pound flywheel fits the SBC, BBC , except for 400 and 454 motors, with 2 piece rear main seal. It has a 168 tooth ring gear. The flywheel is drilled for 11 inch Diaphragm, Borg & Beck, Bork & Beck long, and Mark 12 pressure plates. Internal engine balance and S.F.I. 1.1 certified.